It is the chronic pain disorder which affects trigeminal nerve which is a 5th cranial nerve in human. Due to this pain, there is sensation from your face to your brain. There are total twelve nerves which are involved in the sensory function of head and neck. In this condition, there is inflammation of the trigeminal nerve which causes the severe facial pain. In the initial stages, you may experience some mild attack but later on it becomes more dangerous to that person. In some patients, it becomes more painful and leads to chronic pain syndrome. Vagus: Voice modulation, swallowing and parasympathetic tone of the body. Ophthalmic branch (V1): It is mainly responsible for sensation from scalp, forehead, upper eyelid and tip of the nose. Maxillary branch (V2): It involves the sensation of the lower eyelid, side of the nose, upper lip, cheek, and upper teeth and gum. Mandibular branch (V3): It is responsible for the sensation of lower teeth, chin, jaw, gum, and part of the ear. Due to this Trigeminal Neuralgia sometime patients suffers from the problem of depression and stress because it causes an effect on your daily life activities. It can affect the people at any age but mostly in people above 50 years old. In most people, it affects the right side of the face more than the left side. Sharp and severe pain on one side of your face. It begins from your jaw and along with junction line. A person may feel pain after every few hours. The severity of pain even makes it so difficult that you can’t even wash your face. The pain is constant and gives tingling, numbness sensation. Pain in your eyes while you using the phone, tablets, and computer etc. 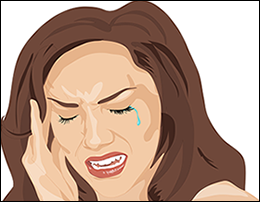 Trigeminal neuralgia is the condition in which trigeminal nerve function is disrupted. This condition arises when there is contact between a normal blood vessel, artery or a vein and trigeminal nerve at the base of your brain. When there is contact between them then it will put pressure on the nerve and cause disruption of it. Aging is another region for the Trigeminal Neuralgia. In this condition, there is damage to the myelin sheet. Tumor around trigeminal neuralgia also causes this nerve compression. Constant concentration on your phones. Laptops and computers. Excess use of electronic gadgets machine. Due to accident or trauma. This may also lead to compression of the trigeminal nerve. Drink hot and cold beverages. There are three doshas in Ayurveda Kapha, vata and pitta dosha. Trigeminal neuralgia is related to Anantvaat in Ayurveda. Among all three dosha vata is responsible for the blockage of nerve channels around your face and head. In Ayurveda, there are numbers of herbal remedies which helps to cure the Trigeminal neuralgia. 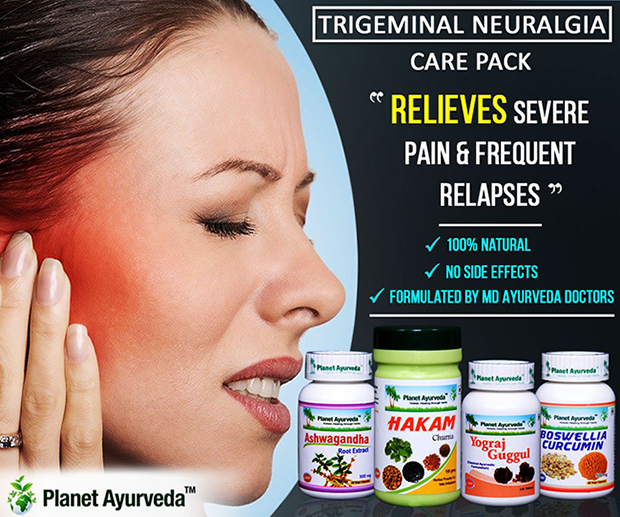 Planet Ayurveda provides a very good Trigeminal Neuralgia Care Pack for the treatment of Trigeminal neuralgia. This product is made from the pure herbal extract of a number of herbs. It is the natural treatment for Trigeminal neuralgia. 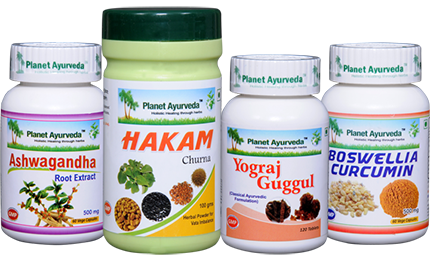 Planet Ayurveda follows all the principles of Ayurveda to make this 100% pure product. In this product, there are no harmful preservative additives and chemical are added by Planet Ayurveda. So there are no side effects of this product. This product is the mixture of several herbs such as Chitraka (Plumbago zeylanica), Pippali (Piper longum), Ela (Eletteria cardamomum), Jeeraka (Cuminum cyminum), Mustaka (Citrus rotundus), Haritaki (Terminalia chebula) Ardraka (Zingiber officinale) and Devdaru (Cedrus deodara). This product is very good for the treatment of vata and Kapha disorder. It also very helpful for the musculoskeletal and nervous disorder. Yograj Guggul helps to reduce the pain due to Trigeminal neuralgia. Dosage: Take 2 tablets after a meal with plain water. It has a very good anti-inflammatory effect. It provides relief from pain. This product is the mixture of two herbs which are Boswellia serrata (shallaki) and Curcuma longa (haridra). Curcumin has a very good quality for the treatment of osteoarthritis and also provide relief from severe pain during Trigeminal neuralgia. These herbs together show the very effective result on Trigeminal neuralgia. And provide a very good result. Dosage: Take 2 capsule with plain water after your meal. Ashwagandha has very effective uses in Ayurveda. It is very good stress releaser from your body. It reduces the level of cortisol and boost your brain and fight against depression and anxiety. It is a very ancient herb which is used for the treatment of varieties of disease. People who are suffering from chronic stress due to Trigeminal neuralgia can be treated with this product. It maintains the proper functioning of the nervous system. Dosage: Take 1 capsule with plain water after your meal. It is the perfect mixture of herbs such as Trigonella foenum graecum (Methi), Lepidium sativum (Chandershoor), Nigella sativa (Kalonji), Trachyspermum ammi (Ajwain). All these herbs are helpful for the treatment of ama which is the main cause of all diseases. It also provides relief from pain during Trigeminal neuralgia. Dosage: Take 1 tablespoon with plain water after your meal.